VMworld 2018 Roundup: Day 1 - T.B.D. There was no Day 0 this year for me, as Saturday was a pure travel day. Sunday was registration day. Is was in and done in five minutes, despite reports that there were hiccups some time during the morning. Then, following a quick annual pilgrimage to the local grocery store to stock up on non-conference food, it was time for Opening Acts. I managed to catch the last panel of Opening Acts, but it was a good one: Beating IT Burnout. 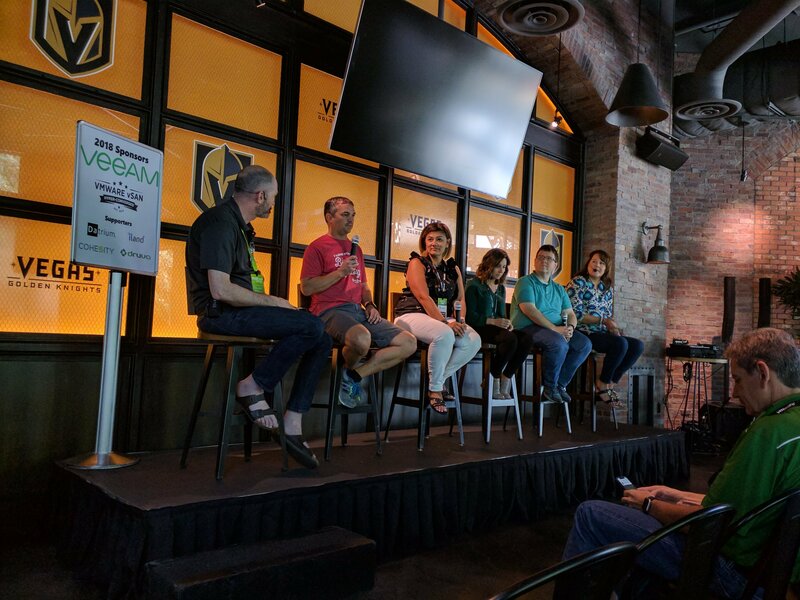 The panel represented those that work in IT, live with folks for work in IT, and support those in IT. The discussion was a collection of experiences of stress & burnout, as well as both bad & good ways to cope and deal with things. Hit up Alastair Cooke, the panel moderator, for some cards containing information and advice on how to deal with stress and burnout. He can often be found in the VMvillage, near the VMTN area where the vBrownBag talks are held. There are a small, limited number of seats available, for the mindfulness workshop two of the panelists are holding this Wednesday. Crush continues to be the most apt description of the annual opening of the Solutions Exchange. Wall-to-wall-to-wall people anxious to grab a drink, a bit of food, and see what the vendors have on display for the week. Another year, another round of new tech companies appear to have joined the vendor floor. It’s always a bit much to drink in, both literally and figuratively, on the first evening. Sunday evening hosted the typical dual party threats of the VMUG Members party and VMunderground. The VMUG Members party was load and exciting. Not as conducive to networking as much as the organizers might have hoped, the digital contact exchange wrist bands seemed more of a novelty than practical in that environment. The atmosphere and spirits were both top notch, however. Michael Dell made an appearance early in the evening to address the VMUG Members and thank them for participating in the community. VMunderground was more suited to chatting. Among the drinks and pub food I managed to have a couple of good conversations with fellow community members. The opportunity to share “war stories” and learn about each other and our shared tech experiences is always highly welcome and appreciated. Some of you more observant readers may notice that some of these posts publish out of order. They get finished as time and schedule allow at this busiest of conferences. Stick around, we’ll fill your quota of VMworld posts all week long. ‘Till next time. Looks like I could have actually gone to this! Especially the Mindfulness workshop….